Most of the textual information on this page was taken from the publications listed in the reference section at the bottom of this page. If you have updated information on the hydrogeology of the Central African Republic, please get in touch. With an ancient history of settlement and trading over thousands of years, the area of the present Central African Republic (CAR) become involved in various slave trades in the 16th and 17th centuries, and the American slave trade in the 18th century. In the late 18th century France colonised part of the region, calling it Ubangi-Shari, and in 1920 this become part of French Equatorial Africa. French colonisers established export crop plantations and built transport and industry using forced labour. The independent Central African Republic was established in 1959. Multiple regime changes since independence, including an attempt to establish a monarchy, have been the backdrop to prolonged political, civil and military unrest in the country. Since 2012, these have had a religious tone, with conflict between Muslim and Christian groups. CAR has had one of the lowest GDPs and Human Development Indices (HDI) in the world since 2000. Diamonds are the most important export, accounting for up to 55% of official export revenues, with significant additional illicit trade. Subsistence arable agriculture, with the periodic sale of surplus crops, is the basis of the domestic economy and supports the livelihood of most people. Cotton is the main exported crop. Hydroelectricity is the main means of generating electricity. CAR has relatively abundant water resources, with high annual rainfall and many major perennial rivers. However, rainfall and surface water resources are not evenly distributed throughout the country and in all seasons, and water supply infrastructure is poor because of years of conflict and little capacity to develop it. Most people rely on groundwater for dry season water supply for domestic and other uses, often from hand dug, unprotected wells. Much of the Central African Republic consists of flat or rolling plateau savanna, around 500 m above sea level. The plateaus were formed by erosion, with occasional inselbergs forming isolated higher areas of ground. In the northeast and northwest are two small mountain ranges rising to over 1,300 m. A ridge of high ground between the two mountain ranges forms a boundary between the Lake Chad basin to the north, and the Congo basin to the south. The Central African Republic has a tropical to semi-arid climate, with average annual rainfall ranging from 1,700 mm in the south to 700 mm in the north. There are two wet seasons, the main one in August-September and the smaller one in May-June. Average temperatures range from about 23 degrees in the south to 26 degrees in the north, with a larger seasonal variation in temperatures in the north. Calculated evaporation potential ranges from 1,500 mm/year in the south to over 1,900 mm/year in the north. 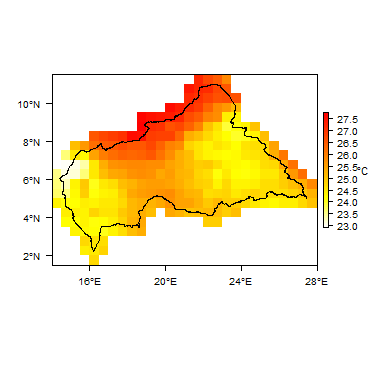 More information on average rainfall and temperature for each of the climate zones in Central African Republic can be seen at the Central African Republic climate page. The north of the country lies in the Lake Chad basin, with sometimes ephemeral rivers draining to the major Chari and the Logone rivers, both of which flow into Chad and to Lake Chad. The south of the CAR lies in the Congo basin, and much of the southern border is formed by tributaries of the Congo river. The main rivers in the country are the Obangui and the Sangha, and their tributaries, which are largely perennial. The Sangha river flows through the west of the country. The eastern border of the CAR lies on the edge of the Nile river watershed. Much of the country is covered by lateritic soils. Mapped soil types include plinthosols, ferrasols and arenosols, with some acrisols. The south of the country is dominated by evergreen tropical forest. Much of the central part of the country is dominated by decidous forest and grassland. In the north, the dominant land cover is mostly shrubland. This section provides a summary of the geology of the Central African Republic. More information is available in the report ‘Groundwater in North and West Africa’ (1988) (see References section, below). The geology map shows a simplified version of the geology at a national scale (see the geology resource page for more details). Another geology map is available in the report by Chirico et al.. 2010. Much of the information on the geology below was derived from this report. Most of the country is underlain by crystalline metamorphic Precambrian basement rocks of the African shield. Younger rocks cover only about a quarter of the country, mainly in the west and north, and smaller areas in the far south. They include small outcrops of Palaeozoic sandstones; Mesozoic sandstones formations; Tertiary sandstone formations; and Quaternary lacustrine and alluvial deposits. Lacustrine deposits, alluvium, laterite/ferricrete Quaternary Quaternary deposits are widespread in the Lake Chad basin in the north, comprising Neo-Chadian or Recent alluvium and lacustrine deposits with thick layers of recent clays (Chirico et al. 2010, United Nations 1988). Alluvium is also seen in river valleys across the country, and there are unconsolidated Quaternary deposits infilling depressions and swampy areas of the Sangha basin (United Nations 1988). Tropical chemical weathering has created extensive lateritic and ferricretic crusts across the country, which in places may be up to 40 m thick (Chirico et al. 2010). Tertiary Bambio Sandstone (in the south); Continental Terminal formations (north) In the north are Continental Terminal type formations in the Lake Chad basin, which form small distinct plateaus, and comprise ferruginous sandstones, sands and cuirasses forming the edge of the Lake Chad basin (Chirico et al. 2010, United Nations 1988). The Bambio Sandstone formation, comprising silicified sandstones, crops out in a small area in the southwest, overlying the Carnot Sandstone (Chirico et al. 2010, United Nations 1988). probably Cretaceous Carnot and Mouka Ouadda Sandstone formations; small outcrops in north Mesozoic sedimentary rocks, probably mostly or all Cretaceous in age, form thick continental sequences resting in angular disconformity on the basement complex, in two outcrops that form distinct plateaus. In the west are the Carnot Sandstones, which are dominantly fluvial in origin, with some lacustrine deposits. They comprise a succession of conglomerates, sandstones and mudstones which can reach 300 to 400 m in thickness (Censier 1990, Chirico et al. 2010). In the east are the Mouka Ouddda Sandstones, also fluvial in origin, and generally less than 500 m thick. They comprise layers of sandstone and conglomerate (Chirico et al. 2010). Mambéré and Kombélé formations Palaeozoic The two major Paleozoic formations are the Mambéré Formation in the west of the country, and the Kombélé Formation in the east, both of glacial origin (Censier et Lang 1992, Chirico et al. 2010). The Mambéré Formation is a tillite composed of both basal and flow tills as well as reworked glacial deposits derived from sandstone, conglomeratic sandstone, and siltstone that occur in continuous beds, lenses, and isolated blocks. The Kombélé Formation is a conglomeratic-sandstone-tillite composed of glacial outwash sediments. Both the Mambéré and the Kombélé formations generally range in thickness from 30 to 50 m and are unconformably overlain by Cretaceous sandstone formations. The total extent of the Palaezoic formations in unknown, because it is overlain by more recent formations (Chirico et al. 2010). Igneous intrusive Proterozoic-Cambrian Discontinuous basic intrusions, including large masses of batholithic granite (e.g. the Bouar plateau and Mt Yade) and doloritic veins (e.g. upstream of Bangui and Nola region) (United Nations 1988). Including the Bimbo and Fatima carbonate formations in the Bangui region Proterozoic Not extensively metamorphosed. These rocks overlie the base complex and are subdivided into three units: an upper unit with a series of schists, quartzites, limestones and sandstones; a middle unit consisting mainly of carbonate formations with a glacial conglomerate at the base; and a lower unit represented by quartzites alternating with sericitic schists (United Nations 1988). The limsetones and other carbonate formations, which include dolomitic limestones and dolomites (UNICEF 2010) are significant for groundwater potential. Granitic-gneissic basement Archean A base complex subdivided into two groups: an upper group formed of quartzites and schists; and a lower group formed of gneisses, micaschists, amphibolites, granulites, migmatites and anatectic granites (United Nations 1988). This section provides a summary of the hydrogeology of the main aquifers in the Central African Republic. More information is available in the report ‘Groundwater in North and West Africa’ (1988) (see References section, below). Upper Lake Chad basin Quaternary - Tertiary The sedimentary sequence in the Lake Chad basin, in the north of the country, forms a series of aquifers at different depths. The upper layers are unconsolidated alluvial and lacustrine deposits, formed of sands and gravels, interbedded with low permeability silts and clays. The upper part is Quaternary; the lower Tertiary in age. Aquifer productivity is controlled largely by lithology, with the sands, and particularly the gravels, usually highly permeable with high groundwater storage potential. The uppermost aquifer layer is unconfined, but the clay and silt layers can act as confining layers, creating perched aquifers and artesian water levels. Alluvial and lacustrine deposits Quaternary (possible Tertiary) In river valleys and depressions across the country are alluvial and lacustrine deposits, sometimes many tens of metres thick. Where they are dominated by sand, they can form local shallow aquifers. In other areas, although they can exceed 150 m in thickness, they are dominated by clay and so generally have low permeability, and usually form a low productivity aquifer (UNICEF 2010). 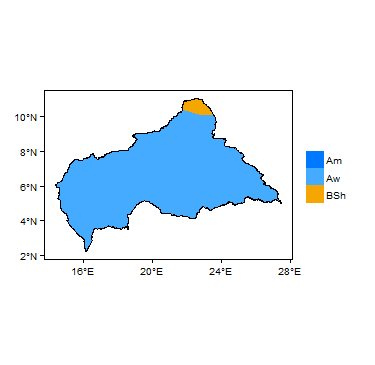 In the Bangui area, this aquifer has an average thickness of 50 m, and a low permeability of 1.1 × 10-6 to 9.2 × 10-6 m/s even in the most sandy lenses (Djebebe-Ndjiguim et al 2013). Where it is most sandy and permeable, wells can produce up to 20 m3/h, and are sometimes used for drinking water supply via boreholes and hand pumps, especially in the hilly surroundings of Bangui. However, generally the Tertiary sedimentary formations that cover most of the Bangui area are poorly permeable and exploited only through hand-dug wells of a few metres depth. Groundwater piezometric levels are usually 1–5 m deep, with an annual water table fluctuation of 2-5 m, with high waters in October and low waters in April–May. At the bottom of the Tertiary sediments lies a more or less continuous layer of lacustrine clay which acts as a low permeability interface with the underlying Precambrian carbonate aquifer (Djebebe-Ndjiguim et al 2013). 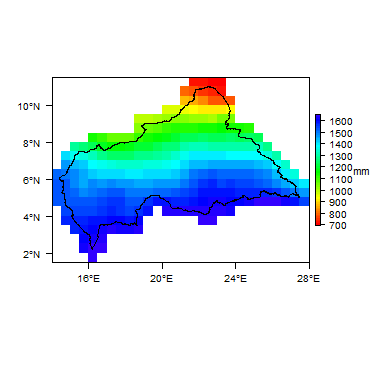 The pH of groundwater from the shallow Tertiary aquifer in Bangui is acidic, between 4.9 and 6.4, with EC (electrical conductivity) values of less than 150 µS cm. More detailed groundwater chemistry of this aquifer is in Djebebe-Ndjiguim et al (2013). Lower Lake Chad basin - Continental Terminal Tertiary (possibly Cretaceous) Below the unconsolidated Quaternary and Tertiary deposits of the Lake Chad basin are consolidated Tertiary sandstones at depth, in which groundwater flow is largely intergranular. Below these, there may be Cretaceous sandstones, in which fracture flow may dominate, but little or no exploration at this depth has been done in the Central African Republic (UNICEF 2010). Carnot and Mouka Ouadda Sandstone formations Cretaceous These formations are dominated by sandstones and are likely to have moderate to high permeability. This, combined with their thickness and areal extent, and the probability that they receive large volumes of recharge through direct rainfall infiltration, means they are likely to form a moderately to highly productive aquifer. There are clay-rich layers interbedded with the sandstone, but information from drilling indicates that the aquifer is likely to be largely unconfined (UNICEF 2010). Groundwater levels are generally 30 to 40 m below ground level (UNICEF 2010). Including the Bimbo and Fatima formations in the Bangui area Precambrian The Proterozoic (upper Precambrian) includes a series of not extensively metamorphosed sedimentary rocks, including limestones and other carbonate rocks. The extent of these formations is not well known: they are known or thought to occur at Bangui and along the Oubangui river south of Bangui; at and east of Bakouma; south of Kembé; in the Zémio-Djema area in the east of the country; and along the southern border (UNICEF 2010). 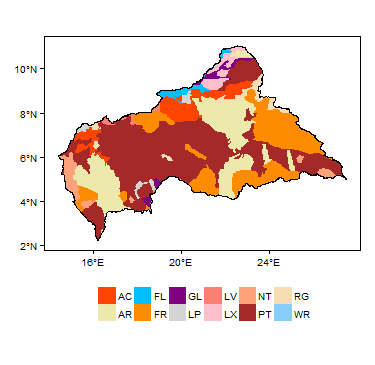 More detail on this aquifer in the Bangui area is in Djebebe-Ndjiguim et al (2013). These aquifers have karstic features (fractures enlarged by chemical and mechanical weathering), which can lead to very high permeability. Karstic aquifers can be highly productive, although they can also be vulnerable to contamination, and to seasonal and longer term variability in rainfall. The Precambrian carbonate aquifer is the most important groundwater reservoir of the Bangui region. In boreholes where karst features were identified, permeability values of 2.3 × 10-3 to 9.3 × 10-5 m/s were measured; where karst features are not present, lower permeability values of 1.0 × 10-6 to 2.1 × 10-7 m/s were measured (Djebebe-Ndjiguim et al 2013). The thickness of the carbonate formations is not known. The groundwater in this aquifer in Bangui has neutral pH and EC (electrical conductivity) values of around 300–400 µS/cm. More detailed groundwater chemistry of this aquifer is in Djebebe-Ndjiguim et al (2013). Crystalline metamorphic and meta-sedimentary rocks; igneous intrusive rocks Precambrian These generally form low productivity, local and discontinous aquifers, controlled by the presence of fracturing at depth, and the degree and nature of near-surface weathering, both of which increase the permeability of the largely impermeable un-altered basement rocks. Weathering is usually a few tens of metres thick. Typical sustainable yields from boreholes in basement aquifers are on the order of 300 to 1000 litres/hour. However, there are also reports of boreholes yielding more than 10 m³/hour (UNICEF 2010). The depth to groundwater level in the aquifers is typically 5 to 20 m (UNICEF 2010). The aquifers are generally unconfined, and receive recharge mainly by direct rainfall infiltration. Where the basement aquifers are overlain by permeable Quaternary alluvium, groundwater in both aquifers may be in hydraulic continuity, and the basement aquifer may receive additional recharge from enhanced storage in the overlying alluvium. Relatively little is known about the current status of groundwater resources of the Central African Republic. UNICEF (2010) collated some information on groundwater levels in different aquifers, but more information is needed in order to better assess groundwater resources, development potential and any negative impacts on groundwater. In particular, information from the drilling, testing and operation of water boreholes, in order to better understand the distribution and nature of the aquifers (their thickness - e.g. the thickness of the lateritic/weathered layer in basement areas; depth to groundwater level and groundwater flows in productive layers; and aquifer productivity). In rural areas, many people use surface water supplies from rivers, lakes and ponds, as surface water is relatively abundant for much of the year. Surface water quality can be poor, and sources can run low or dry in the dry season, and so shallow groundwater is also used. Most groundwater is abstracted from hand dug wells, with relatively few drilled boreholes. Most urban areas received piped water supplies derived from treated surface water, but in urban areas not served by municipal water supplies, groundwater is often used, again generally from shallow hand dug wells. Water supply infrastructure is generally poor as a result of years of conflict and lack of capacity for development. Improved water sources, such as mechanically drilled boreholes or even improved hand dug wells with hand pumps, are relatively rare. Some NGOs have been promoting manual drilling as part of water supply development in rural communities, in the absence of mechanical drilling equipment (eg Practica Foundation et al. 2014). In the 1980s, the National Water Corporation (SNE) was reponsible for water supplies in urban areas, in partnership with the Ministry of Public Works and Urban Development; and in rural areas, the Department of Agricultural Engineering of the Ministry of Agriculture and Livestock was responsible for developing and maintaining water points. There are limited data on the existence, locations and characteristics of groundwater sources, including boreholes and hand dug wells. UNICEF (2010) compiled a database of approximately 2600 groundwater points (thought to be largely boreholes and hand dug wells, but information on water point type is often not available) from available information from government and NGO sources; however, there is limited information on the water points. No geological log information is available, and little information on groundwater quality. Some had information on rest (static) groundwater level. These water points are mostly clustered in the west and south of the country, in the regions of Ouham, Nana Gribizi, Lobaye, Ombella Mpoko, Kemo and Lower Kotto. Boreholes were drilled as part of several projects, mainly by international donor organisations. The average depth of boreholes drilled in dominantly sandy lithologies is about 25 m; and for those drilled in mixed clay-sandy deposits is about 60 m (UNICEF 2010). The following references provide more information on the geology and hydrogeology of the Central African Republic. Censier C. 1990. Characteristics of Mesozoic fluvio-lacustrine formations of the western Central African Republic (Carnot Sandstones) by means of mineralogical and exoscopic analyses of detrital material. Journal of African Earth Sciences Vol.10, Issues 1-2, pp 385-398. Chirico PG, Barthélémy F and Ngbokoto FA. 2010. Alluvial Diamond Resource Potential and Production Capacity Assessment of the Central African Republic. Prepared in cooperation with the Bureau de Recherches Géologiques et Minières and the Direction Générale des Mines under the auspices of the U.S. Department of State; Scientific Investigations Report 2010–5043. Djebebe-Ndjiguim C, Huneau F, Denis A, Foto E, Moloto-a-Kenguemba G, Celle-Jeanton H, Garel E, Jaunat J, Mabingui J et Le Coustumer P. 2013. Caractérisation des aquifères de la région urbaine de Bangui comme ressource alternative en eau potable. Hydrological Sciences Journal 58 (8), 1760-1778. Foto E, Djebebe-Ndjiguim C, Huneau F, Vitvar T, Travi Y et Ito M. 2012. Central African Republic Uses Isotopes to Investigate Drinking Water Supply Potential. In Water and Environment News 31, September 2012, IAEA. Foto E, Djebebe-Ndjiguim C et Huneau F. Gestion des ressources en eau dans le bassin du Lac Tchad par des techniques isotopiques. Rapport-final RAF 7011. Foto E et Huneau F. Etude isotopique et hydrogéochimiques des eaux souterraines du sous-sol de la région urbaine de Bangui. Rapport Technique Final CAF8003. RCA. 2010. Etude de faisabilité des forages manuels, identification des zones potentiellement favorables. DGH Bangui, 30p. United Nations. 1988. Groundwater in North and West Africa: Central African Republic. United Nations Department of Technical Cooperation for Development and Economic Commission for Africa. Natural Resources/Water Series No.18, ST/TCD/5. This page was last modified on 18 February 2019, at 11:30.